Pakkuda kaunid Tiibeti palvelipud - 7 tšakrat! Puuvillasest riidest, külg ca 21 cm, nöör ca 160 cm- saab kohe üles riputada! Pilt illustreeriv - ei hakka pakendeid avama. Delightfully these colorful flags flap in the wind. On roofs, temples, bridges or holy sources they wave cheerful in the wind, everywhere in Nepal. Nevertheless, they have a deeper meaning for the people living there. They should always remind of the divine. The mantrams and pictures on the flags are said to bring protection and blessing to the whole universe. By hanging a prayer flag in the wind, problems and suffering are consigned to transformation, so that life can flow again. 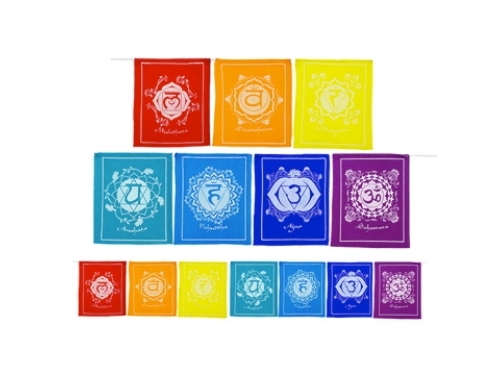 The colorful flags symbolize the five elements. As time goes by, the prayer flags dissolve due to the impact of the sun, wind and rain. This is indeed desired, because in this way, the blessings can get into the five elements.